The cold weather is upon us here in Hong Kong ! yep, we are looking at temperatures dipping down to 13 degrees celsius this weekend which makes it the perfect weather to be busting out your bold and darker lip colours to bring some colour to our faces. I decided to break free from my usual light berry shades and venture into something a couple shades darker, the more purple toned - wine colours. 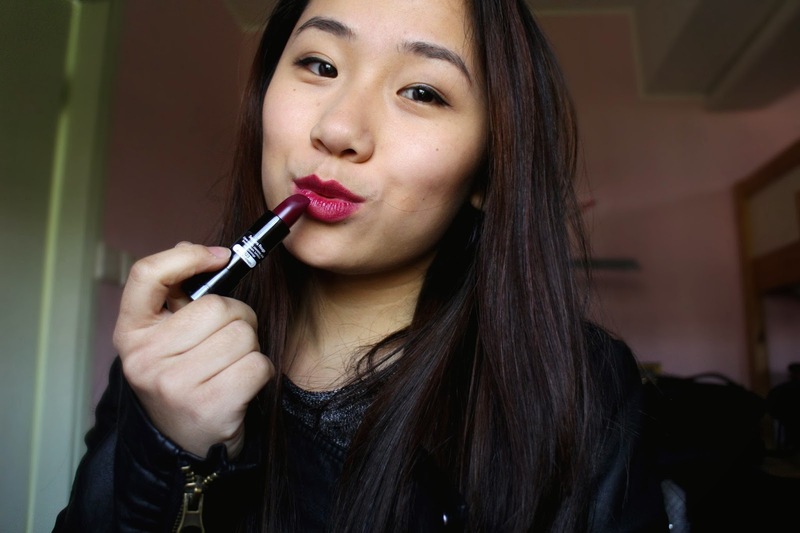 Now, I'm aware that purchase a high - end lip stick of a darker shade might not be as ideal for those of you who are starting out in makeup, however the quality of the lipstick plays a HUGE role in the outcome and you'll soon find out why. Sephora provides a wide range of lipsticks available, I am not too certain which line this lipstick is from but it is part of the permanent collection and all the lipsticks are differentiated through their packaging if you want to locate them. 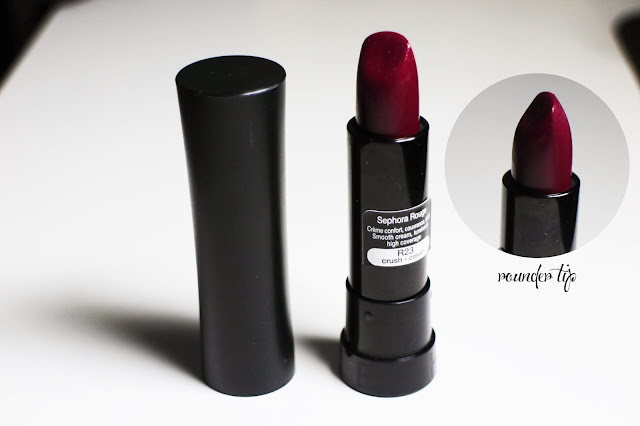 The lipstick is incredibly matte, has a slight scent to the lipstick but nothing that you can smell throughout application of the lip product. It appears really dark but the initial first layer comes off as a magenta and it is definitely buildable to achieve the a deep magenta as opposed to the colour shown on the swatch in the packaging. The packaging is incredibly sleek, its all black with a swatch of the colour at the bottom. There's nothing out of the the ordinary about the lipstick. Except perhaps the way the lipstick itself is shape. Instead of having the usual high peak that most lipsticks have, it comes with a more rounder tip which I feel that it's a little easier to contour my lips. 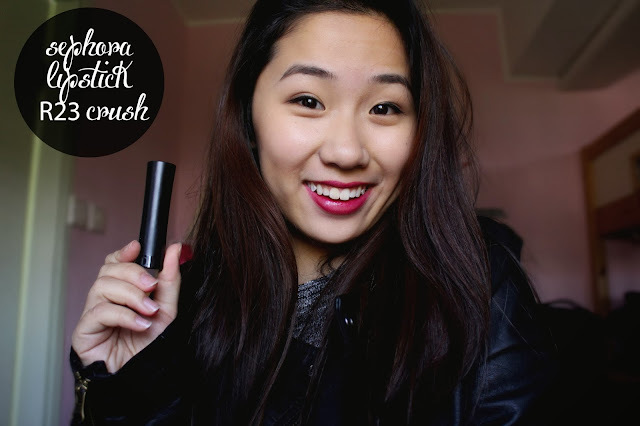 The product on its own is very matte and stays that way throughout the day. Here's where my love hate relationship with this product begins. I absolutely love the colour, HOWEVER, the lipstick is quite dry and on its own and I find it very hard to purse my lips together to blend the colour out. I find myself using my fingers / Q-tip / lip brush to blend the colour tougher to get an even finish. Less than an hour after application, I had one last check in the mirror and to my dismay... the colour started shifting towards the centre of my lips created a very odd gradient? I know that having the colour graduately fade through the center of your lips is a trend but in this case, I'm not over the moon with the outcome. I advise putting on a lip balm that sinks in quickly at least 15 minutes before application of this lip stick to provide a smooth and moisturised canvas. I've tried this and having the lip balm applied too close with the interval of the lipstick can create a very cheap / glossy appeal. 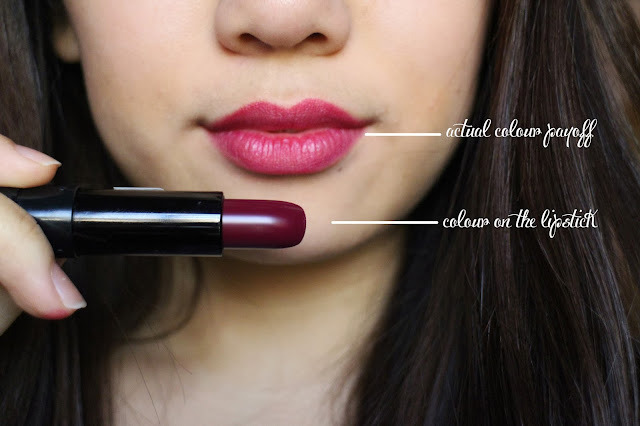 I know the colour appears a lot lighter than the swatch provided on the lipstick itself, but keep in mind that all lipsticks don't come out 100% true to colour due our natural lip shade that acts as the canvas. 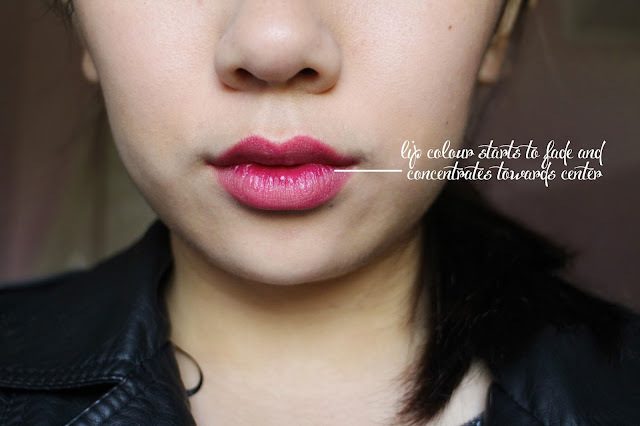 The lip colour fades off into a slightly uneven tint after say 2/3 hours of application (without consuming anything). This product didn't impress me as much as I hoped it would and could have been better had the texture of the lipstick been a lot smoother. 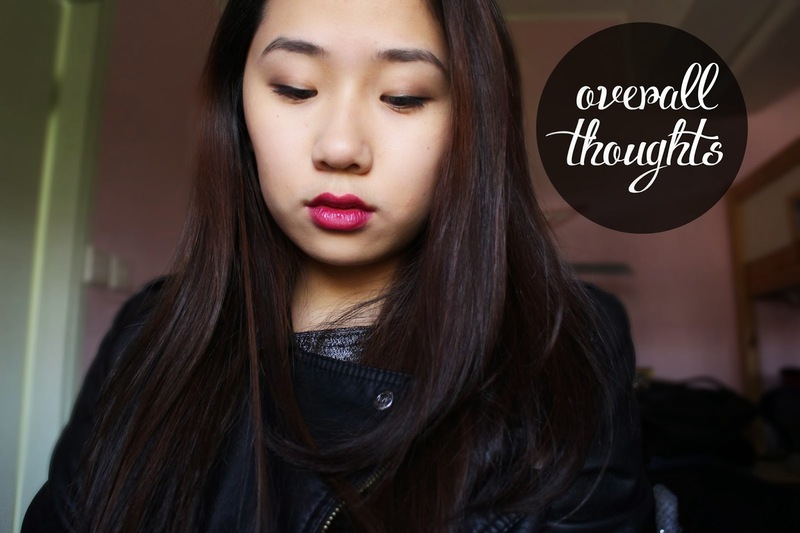 I love matte lipsticks and I'm sad to see this one turn out the way that It did. Of course there are ways around the product but, compared to other lipsticks that I've tried at the drugstore, I feel that you can get your money's worth out of something else that provides better quality. To sum it up, no this product won't be going to waste. I do like the colour very much and will definitely be using it with a well prepped based ( exfoliated lips & prepping the my lips with lip balm). I would very much have liked the lipstick it self to have been more moisturising for mornings where I'm rushing to get out the door and would like to skip the step of moisturising my lips. Sad to say no, I feel that there are several other drugstore brands of the same price that can provide something of a better quality. You can check out Topshop's "The damned" lipstick as a slightly lighter dupe for this shade. What's your favourite lip colour for winter? Really gorgeous color. It looks great on you. thanks Cassandra :) had hoped for better quality on the lipstick formulation though! Looks great. Funny I just found this lurking in the back of my makeup stash and I absolutely love it. As you say lips absolutely have to be well moisturised in advance but I don't find it overly drying if you take that step. Such a shame that this beautiful colour couldn't come with some moisture of its own! I don't have a problem with it being too dry after but it feathers out quicker than I hoped it would :( Glad you've rediscovered a gem in your makeup stash though!